Compact design, flexible installation options and versatile interfaces make the new scanCONTROL 2600/2900 laser line scanners a suitable choice for high-precision profile and dimensional measurements in production environments. Micro-Epsilon has developed an extremely compact, lightweight laser profile scanner. 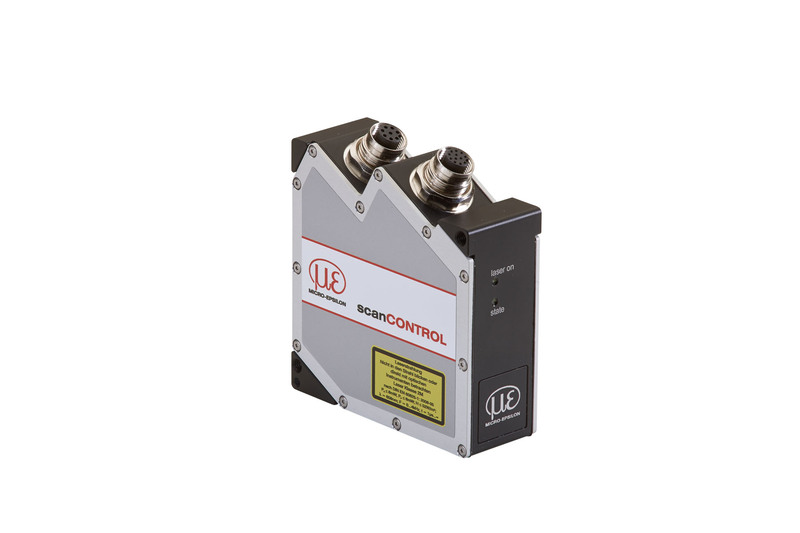 The scanCONTROL 2600/2900 optoelectronic sensor with integrated controller is enclosed in a 380g aluminium housing. The scanCONTROL 2600 offers a measuring rate up to 640 points per profile and the scanCONTROL 2900 up to 1280 points per profile. The measuring range starts at a distance of 53 mm from the sensor and can be extended up to 390 mm, depending on the sensor model. The same size of housing is used for the various measuring ranges. The following interfaces are available for scanCONTROL 2600/2900: Gigabit Ethernet interface for transferring profiles and a multi-purpose interface for RS422 connections. At the same time, the digital inputs can be used for synchronising and triggering, or as encoder inputs. An additional output unit can be used to provide more output signals. scanCONTROL 2600/2900 is particularly well suited for applications that require a low sensor weight, for example, in automotive production or when sensors are mounted to robot arms.